Alex Iwobi is the owner of a Premier League record in the 2018-2019 campaign after helping Arsenal beat Isaac Success's Watford at Vicarage Road on Monday night. According to football statistics website Whoscored.com, the Nigeria national-teamer made seven key passes from open play in Arsenal's 1-0 win over Watford on Monday night, a record in a Premier League match this season. By registering seven key passes, Iwobi had five final passes more than teammates Aaron Ramsey, Granit Xhaka and Mesut Ozil. 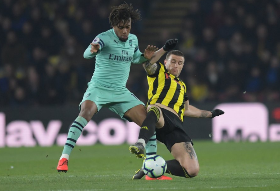 In other stats, Iwobi attempted three shots with one on target, had a passing accuracy of 88.7 percent, touched the ball 85 times and racked up a team-high three tackles. The Super Eagles star has logged 1,705 minutes from 30 appearances in the Premier League this season.